Stuart Lumb, aka JetSetSuperVet, has been on his travels again. This time he was in the paradise island of Maui for the XTERRA World Championship. He may well have been the 'lantern rouge', but as he says himself, he was a "survivor"! Apparently Maui has been voted the world's most beautiful island, although as I pushed my bike up a particularly steep part of the bike split taking in the scenery was the last thing on my mind! I qualified for Maui at the UK XTERRA race back in June, where it never stopped raining. In Maui it was 30C - all day. 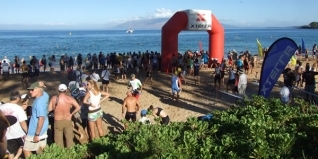 It was the 13th XTERRA World Championship. That flagged up my concerns, being a bit superstitious and yes , it was the hottest race day on record! There were only 112 competitors racing in Wales which seems a very small number when compared with conventional triathlon nationals - but as I squelched across the finish line in Resolven back in June, I realised why. XTERRA racing is certainly not for the faint hearted and has to be equivalent to 70.3 racing in toughness - if not more. You can switch off to some extent when racing on a road bike but you do that at your peril on an MTB. 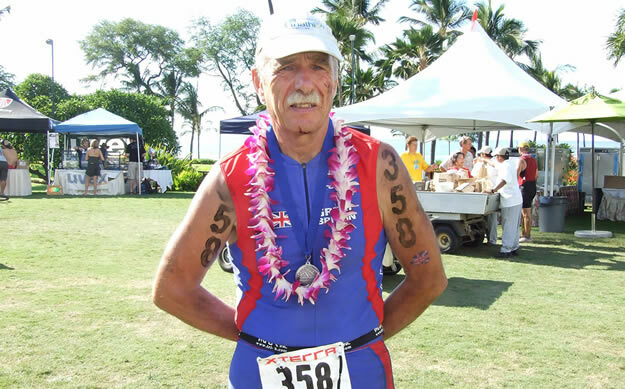 I was one of a select group of Brits that made it to Maui - thank goodness for my Air Miles - and one of seven in my age group. During pre-race training I bumped into Julie Dibens and Daz Parker and was very envious of Julie's On-One Lynskey Titanium Soft-Tail prototype, which had cost quite a few quid to build - like what I would pay for my car? I was brought up near Todmorden so should stop by soon and say hi to Brant Richards. I gather On-One are considering producing this bike commercially. I do hope so, but I think I'll need a fair few quid in my piggie bank to get one. Race day was now looming and I was reminded of when I raced in the Worlds in Honolulu in 2005. I started at 6.30am and finished by 9.30, before it got too hot. XTERRA, bless their cotton socks, let us have a lie in as we didn't start till 9am, but meant I would be racing through the hottest part of the day. The swim was non wet suit of course. I love my neoprene as I have heavy legs but got round the two laps ok. You ride the bike split unseen so that's great fun. It's not rocky like Dalby Forest but the ash and loose rock are tricky plus the heat is really a killer. I'd heard all sorts of tales about punctures so had two spare tubes on board - which fortunately weren't needed, although many athletes did have flats. There's a swim / bike cut off and this was praying on my mind plus my situation wasn't helped when I came off my bike early on, bashing my stop watch, so I just had to clog on and hope for the best. They say pride comes before a fall - I was thinking how well I'd done when on the last descent a gulley and loose gravel caught me unawares and I ended up skidding along on my chin. Nothing serious fortunately apart from a bruised thigh. An American girl behind me stopped to see if I was ok, which was very selfless of her as she was also worried about missing the cut. I climbed back aboard my trusty steed and pedalled furiously into T2 and was delighted to be told I'd beaten the cut off by 7 minutes. I'd brought cross country trainers for the run which in hindsight I didn't really benefit from. Anyway, I hobbled out of T2, on my merry way. The first mile is on-road so nice and even but my thigh kept reminding me it wasn't happy, plus the heat was kicking in again. The Trade Winds usually start blowing around midday but unfortunately that day the Gods forgot to turn the fan on! The run split is mainly off road. One section on the mountain is littered with small rocks conveniently placed to turn your ankle. Then it was on to Makena Beach, past all the locals lying in the sun. Alright for some! I managed to negotiate Spooky Forest safely but can appreciate how Emma Smith had a close encounter with a big tree. The sting in the tail is the weaving undulating rocky path, just before the finish. Dave Nicholas who is the race organiser and who had been of immense help to me pre- race suddenly appeared, shouting words of encouragement at me. Good man! The last few yards were uphill to the finish where a beautiful flower lei and my medal were placed round my neck by an equally beautiful Maui girl - and I was a finisher. It was an amazing race. For me, just under 6hours at 0C was certainly a tough day at the office. The medal we won is inscribed "Survivor". That says it all.